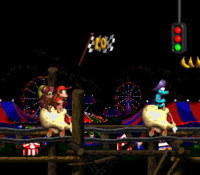 Rickety Race is the twentieth level of Donkey Kong Country 2: Diddy's Kong Quest and is the fourth level of Krazy Kremland. This is the second roller coaster level in the game. 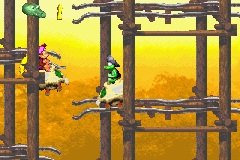 Its unique feature is the ability for the heroes to race nine Klanks to the finish, although this is completely optional, as the Kongs may just take their time. Every time Diddy or Dixie defeat a Klank, though, they receive a prize. The Klank in first has a DK Coin, so the Kongs must reach him before he gets to the finish if they desire this item. There is also a hidden Plus Barrel that the primates can use to increase their speed. As the Kongs approach a pitfall, a warning sign pops on screen to notify them of it. 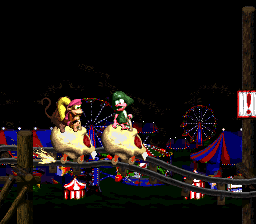 This is the only stage in the original Donkey Kong Country 2 that doesn't have a Star Barrel, although one was added in the Game Boy Advance remake. The Kongs begin the race in tenth place. The level begins on a long, wooden platform with a tunnel containing a DK Barrel on it. The Kongs can find a hidden tunnel above here that leads into a Bonus Level. A track is at the end of the platform, and a Roller Coaster waits on it, along with a Klank in another cart. When they land in the cart, a traffic light appears, signaling them to go. Should the player hold left on at this point, they can go backwards to hit a hidden Plus Barrel that'll increase their speed throughout the race. When they begin moving, they find themselves still behind the Klank, whom they can pass to gain ninth place; more Klanks appear in areas ahead every time they catch up to one. As the heroes try to catch up to the foe, they pass a gap and then ride down a large hill with the letter K just before it. Once they make their way down, they ride back up another hill that leads them towards a small gap. It is followed by another small gap with a hill leading downwards at the other side of it. A flat part of the track is at the bottom of the hill, but it then curves upwards into an additional hill. Once the heroes ride up and down the hill, they reach a gap. A rather flat pathway is on the other side of the abyss. An abyss is farther down this area, and as the heroes race down the bumpy track following it, they pass groups of four bananas. Another gap is at the end of this track. A large hill that dips downwards is ahead. A hill leading up is immediately after it. There is another gap at the top of the hill it is followed by the letter O and a few more hills. A pair of gaps are near here. Once they are crossed, the Kongs head up a hill that pulls them up to another gap. Two smaller gaps follows this. After the last gap, the heroes ride up a hill (where the Star Barrel can be found at the top in the GBA version). A large hill immediately follows, which drops the Kongs towards a flat part of the track. Eventually, they come up to a pair of gaps that they must hop over to reach another flat area. Two more small gaps are after here, followed by another pair. These gaps are slightly smaller than the previous. The letter G is passed after these gaps, and it is followed by a small tunnel that, in the Game Boy Advance version of the game, contains a Golden Feather. A section full of hills that lead the heroes up and down is ahead. Four rather wide abysses are soon after it. After one last hill, the Kongs ride into a tunnel at the end of the flat pathway. When they enter the tunnel, they find themselves on foot again. An End of Level Target is ahead of here that they can hit to complete the level. A prize is given from the target is they jump on it from a hidden hook. At the beginning of the level, the Kongs should use their Team Up move to throw one another upwards onto the above wooden platforms. When they are at the top, Dixie Kong should be used to hover across a large gap to a small tunnel. The tunnel leads to a Bonus Level, where the Kongs must ride a Roller Coaster on a track with a few gaps in it. As they ride, several Klanks drive towards them. They must defeat at least five of these Klanks within ten seconds to make a Kremkoin appear at the end of the area. They must collect this coin before the remaining time runs out, and without falling into any abyss. DK Coin The DK coin can be obtained by defeating all nine Klanks in the main level. Golden Feather (GBA version) Near the end of the level, the Kongs enter a small tunnel. They must quickly jump to collect the hidden Golden Feather. Just before a large hill at the beginning of the level. After the gap past the Klank in fourth place. Obtained by defeating the second-to-last Klank. Near the gap after the tunnel with the DK Coin. The Kongs start the race. The Plus Barrel behind the start. The Kongs race towards the letter O. The End of Level Target. Dixie uses the Helicopter Spin to reach the Bonus Area. The Kongs wait at the starting line in the Game Boy Advance version of the level. Defeating the eighth place Klank. Jumping for the "K" Letter. The level design for Rickety Race, drawn by Rareware employee Gregg Mayles.